If you're interested in purchasing a finished bracelet, my son has agreed to make them for 12.50 each using handmade clasps, or 14.00 dollars using a plastic clasp. Clasp options are brass, copper or aluminum, color options we can get easily are black, gray or olive. Email me at shalasbeads at (nospam) gmail dot com to order one. It's always hard to make things for young men isn't it? I made my son a paracord bracelet because I wanted to see if I still remembered how to make them. I bought the paracord, but completely forgot the clasp. Whoops. So after I got home with my paracord, I had to figure out the clasp, I did have some 16 gauge copper wire. So I made a clasp with that. William liked his bracelet enough he asked me to show him how, and has since made them for other male family members. Paracord- about 8-10 feet worth. I stretched it out between my arms as far apart as they would go twice, and for me, that's a little under 8 feet, for William, it's a little under 10, William's arms work better for bigger bracelets then mine. Thread or dental floss- this is a temporary part of the bracelet that will be cut off and discarded, so anything thin and strong will do, if you have pink crochet thread handy, that works. pliers- I used chain nose and round nose, but next time I'm using my husband's pliers for the extra strength and size. To start with, the clasp since that's really the only thing new in this version. Cut a piece of 16 gauge wire about 4.5 inches long. I used copper because I had it on hand. You can buy 16 gauge copper wire at most hardware stores by the foot. Bend the wire in half, then coil each side up to form loops as evenly as possible. Bend the top part of the clasp over the bottom part to form a hook. See illustration. Set the clasp aside for a minute, and seal cord ends by holding the end of the cord with the pliers with just a little bit of cord sticking out of the top, and singing it with the pliers until it melts and seals. Be careful with the ends right after you seal them. Molten plastic can leave nasty burns. Fold the cord in half, and wrap it around your wrist starting at the folded end, add a half inch for the room the knots take, and tie your thread around the 2 strands at that point. Thread each loose end through the loops on the clasp, and start tying square knots. The center folded strands are the filler cord, and you tie your knots with the two loose ends. Left side goes over the filler cord, then under the opposite cord, then take the right hand side, and go under the filler cord, and over the left hand cord.Pull tight, that's half the knot. Then take the left hand side and pass it under the filler cord, and over the right hand cord, and the right hand cord goes over the filler cord, and under the left hand cord. Pull tight, one square knot completed. (see illustration) Tie a few more knots that way,pull tight, push up as needed, and then snip the thread holding the cords together and pull it out. Continue that way down the cord, pushing up knots as needed to make it tighter. When you've got about an inch left of the filler cord, tie the ends together in a square knot (left over then under right, right over then under left, pull tight) and trim and seal the ends (less secure) or (more secure) tuck the ends of the cord under the last knot on the side that will be facing out, and pull tight, hold both ends with the pliers, and trim, then burn the ends to seal them together. The sealed ends can be cut off and the bracelet can be unknotted if you ever need 10 feet of really strong cord, which is nifty, but for most of us, unlikely. Paracord comes in a lot of great colors now, but black or olive are most common. 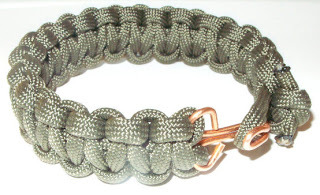 Check your local Army surplus type store or an outdoor sporting goods type store for paracord. I love tutorials. Thanks. I wonder if I could do this in wire. I'll give it a try and see.